This will be my first ever 'Nails Of The Day' post. I'm surprised to not have done one before, as I am a bit obsessed with nail varnish, especially pastel colours such as Essie Bond With Whomever, which I recently purchased. This is my first ever Essie nail varnish so I have now officially lost my Essie virginity and I'm proud as well as my NOTD virginity. Double proud?! I'm not entirely sure if I like the combination of the floral transfer as well as the caviar beads but I wanted to try something a little different to my usual boring plain coloured nails. My floral nail transfers are £1 from Primark and my caviar beads are from Poundland, which I got 12 different colours all for £1. Total bargain for nail decorations if I may say so myself! What's your favorite Essie nail varnish? 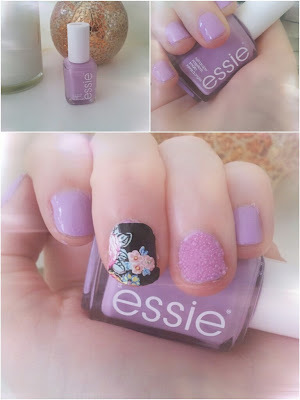 How would you decorate your nails with Essie Bond With Whomever?